Culms: Erect, light green, grooved. Leaves: Blades channeled or sometimes rolled inward, several, 1/3 to 1/2 as long as culms, less than 1/10 inch wide, glabrous; auricles membranous, tiny, rounded, colorless, at juncture of sheaths and blades. Inflorescences: Cymes, open to compact, 1 to 4 inches long, terminal; branches many-flowered, ascending; bracts 1-several, leaf-like, usually longer than inflorescence. Flowers: Perianths about 1/10 inch long; secondary bracts at bases of perianths paired, small, conspicuously pointed; perianth segments 6, erect, straw-colored, nearly equal in size, pressed against surfaces of capsules; tips tapered to points; stamens 6, about 1/2 as long as perianth segments. Fruits: Capsules, oblong to egg-shaped, shorter than or almost as long as perianths; tips blunt; seeds numerous, tiny, oblong or egg-shaped. Habitat: Wet to drying upland prairies, marshy sites, woodland edges, and ditches. Distribution: Principally east 3/4 of Kansas. 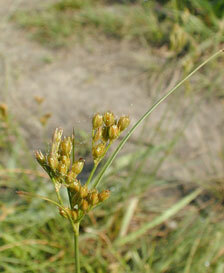 Forage Value: Rushes have limited forage value.